The regional architecture put in place by the imperial system makes it very hard for a left-wing revolution to succeed. While regimes aligned with the United States have successfully suppressed their internal revolts, in countries like Iraq, the disintegration of the nation-state has splintered society along communal lines. The authoritarian “republican” regimes most challenged by the Arab Spring are for the most part the calcified remains of Arab nationalism—just as the “Kemalist” Turkish state that Tayyip Erdoğan has now conquered was the corrupted remnant of the ideology of state-led modernization from which Arab nationalism once sprang. Turkey under the AKP represents a unique case in which ultra-capitalist “political Islam” has changed the state’s ideological complexion while keeping the nation-state intact. Washington once hoped that Ankara would serve as a model for the Arab countries, but this was never a likely prospect. Post-colonial nations whose statehood was always more fragile than that of the Ottomans’ heirs, Arab states in turmoil have not well withstood the communitarian pressures emanating from Riyadh and Tehran. The ferocious return of local and communal loyalties upon the collapse of a state power whose kleptocratic cronyism had long gnawed at its legitimacy has been a serious challenge to the revolt against Bashar al-Assad. Syrian dissident Louay Hussein writes of an opposition that splintered almost immediately into myriad local administrations and struggles with the regime, as if the state’s long-term prevention of national civil society were a barrier even to citizens’ efforts to unite against it. Though the experiences that triggered the revolt—the twin scourges of environmental crisis and the withdrawal of the social safety net due to neoliberal reforms, injured dignity at the hands of a haughty regime and the encouraging spark of the Arab Spring—were certainly national, their translation into action took a decisively local form. Even “the slogan ‘overthrowing the regime’, was, Hussein writes, “a regional slogan rather than a national one.” It is this localism, he argues, that left Syrians largely defenseless in the face of foreign groups peddling fundamentalist ideologies. Assad’s cohort belongs to a minority community making up only 12% of the Syrian population, of which the Sunnis for their part comprise three-fourths. On the face of it, it seems unlikely that such a regime would have much to gain by inducing confessional conflict. Yet while an authoritarian state based in a small minority blocks the more overt manifestations of sectarian nationalism—Syria, like Saddam’s Iraq, is neither Saudi Arabia nor Iran—it makes some destructive paranoia inevitable. Assad’s inner circle of military men is almost exclusively Alawite, no doubt for reasons of trust, and the victims of army massacres early in the war were overwhelmingly Sunni, which helped fan the flames of inter-communal hatred. But was the opposition entirely blameless in the war’s sectarian drift? Activists often make it sound like the reluctance of minority groups to support the revolution stemmed purely from paranoid fear stoked by state propaganda. The appearance of genocidal slogans at rallies, and anonymous threats to prominent minority citizens, they uniformly describe as muhaberat provocations. It is reasonable to assume that Assad’s minions would do such things, but in not a few areas “liberated” by rebel armies, massacres and forced conversions of minority communities have taken place. Revolutionaries may dismiss these atrocities as the work of interlopers representing foreign states, but where the different anti-Assad forces are not separate on the battlefield, how can they be distinct in fearful Christian, Druze and Alawite minds? Scholars and intelligence professionals who have studied the military lay of the land generally agree that since 2013 at the latest Sunni jihadist elements supported by neighboring states have been the dominant fighting forces on the rebel side. The Free Syrian Army, generally described as a loose umbrella of different groups, is no longer distinct from these jihadist elements. The city of Gaziantep in southeastern Turkey, long the epicenter of Turkish state investment in the FSA, is now also the hub of Turkey’s homegrown IS network; former fighters from groups labeled “moderate” have since committed suicide bombings in Turkey. Islamist FSA members are now guarding occupied Jerablus in Turkish police uniform. It made tactical sense that, going into the September ceasefire, East Aleppo’s rebel fighters did not want to separate from their Al Nusra component, as per the agreement worked out by the USA and Russia. The question is whether a revolution that depends on Al-Qaeda-like groups for survival can still act as an emancipatory force. 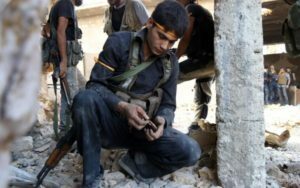 It is hard to dispute that international leftists owe solidarity to their comrades in Syria, but what is the meaning of “solidarity” in the absence of material assistance? Any weaponry sent their way would primarily benefit the likes of Ahrar-ash-Sham, with their Turkish and Gulf State sponsors. As Joseph Daher implies, such armed facions have tolerated a revival of secular democratic protest whenever there is a letup in Assad’s air campaigns. They certainly have nothing to gain, public-relations-wise, from brutally cracking down on it right now. This does not mean, however, that the democratic demonstrators would have their way once the armed factions doing the fighting manage to defeat Assad militarily. The character of the states that have been sponsoring them makes them unreliable in that regard. Just as the original protest movement’s non-sectarianism might come to grief under the victorious arms of the factions who now dominate the armed struggle carried out in its name, so also would many demonstrators’ attention to economic justice be in question if those armies were to triumph with the assistance of the United States, say, under the new atmosphere of a Hillary Clinton administration. Anti-authoritarians have been justly impatient with the exclusive priority given to geopolitics in much of the anti-imperialist Left’s discussion of the conflict, but the geopolitical framework in which the protest movement finds itself has made, and will continue to make, it difficult for that movement’s democratic values to assert themselves. Like its secularism, the regime’s anti-imperialism has of course always been more pragmatic than principled. Much has been made in some quarters of the Bush Administration outsourcing torture to Damascus, making Assad a cog in the US “war on terror.” Assad was no doubt pleased to ingratiate himself with the Americans by defending his own regime brutally from the jihadist threat, but that did not stop him from sending other mujahidin from Syrian prisons across the border to Iraq, to disrupt the US occupation of that country. His friendship with Hezbollah still wins him prestige in some anti-imperialist circles, and incurs the occasional Israeli airstrike. Assad’s release of one Sunni jihadi bunch from prison at the beginning of the uprising, at the time marketed as a conciliatory move, now looks more like a ploy to reshape the armed opposition into the kind of force that western powers would not want to assist. But assist it they did, at least indirectly. Hillary Clinton has argued that things could have gone more smoothly if the USA had dared arm the Free Syrian Army at the outbreak of the conflict, but the flow of arms from Gaddafi’s arsenal to Turkey-based rebel factions in 2011 is well-documented, as is Clinton’s own support for “covert assistance” at early stages of the war—a secret that, oddly, she thought Wall Street executives would keep for her. Those active in the Syrian uprising complain that their side only got weapons when on the brink of defeat, never at moments when they looked poised to overcome Assad. Leaked correspondence from within the US cabinet shows ongoing contention over the level of support to be granted the rebels, with John Kerry continually seeking enough military aid to give the opposition a strong hand at the negotiating table. Do these findings prove opposition activist Joseph Daher’s assertion that the USA sought, not Assad’s overthrow, but its survival in a weakened and modified form? Or more cynically, could the US have been putting into practice the plan advocated by neoconservative misanthrope Daniel Pipes, who wanted the opposing sides to grind each other down as did Iran and Iraq in the 1980’s? In a US administration beset by factionalism and prone to drawing “red lines” and then backing away from them, Machiavellian strategy can be hard to distinguish from indecisive dithering. The only thing crystal clear is the result: the destruction of much of the country, and the devolution of the military conflict into a regional contest of competing jihadisms, fought predominantly (if not exclusively) on both sides by foreigners. How could it have gone otherwise, given the reactionary character of regional power, which western power had such a strong hand in putting into place? Aslı Bâli and Aziz Rana argued in 2013 that any act of escalation on the part of the western allies, including armed support for rebel factions, would provoke an equal and opposite reaction from the axis of Russia and Iran. The penultimate act in the drama of escalation came when the Turk-Saudi-Qatari alliance, with anti-tank weapons supplied by the United States, organized the Army of Conquest to challenge the state army in north-central Syria, temporarily turning the tide of the war. Assad responded by bringing Iran, Hezbollah and Shia militias further into the conflict and inviting his Russian allies to intervene directly from the air. America’s sometime allies in Syria now face a rival power that can apply the “war on terror” script with more consistency than the US itself: Putin’s Russia. Post-Soviet Russia is hardly an imperialist state, in the Leninist sense of the word: its bourgeoisie does not maintain capitalism primarily through the exploitation of poorer nations. What foreign outposts it has, it maintains partly out of fear of American encirclement, partly in order to shore up the prestige of an historical “great power” which its leader has staked his legitimacy on reconstructing. Maintaining markets for weapons exports may be a third factor, but hardly suffices to account for the amount Moscow is now spending to keep Assad in power. 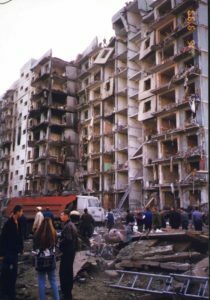 The 1999 Russian apartment bombings: the string of terrorist attacks which fueled Putin’s road to power. Vladimir Putin came to power in the wake of a string of Moscow apartment bombings long pictured in some quarters as false-flag attacks. Having made his political name in the ferocious suppression of the revolt in Chechnya, he has a natural affinity with the American “war on terror” and bases much of his appeal on the idea that he can do it better than Washington. Once the capital of “the socialist camp,” the Kremlin is now an alternate pole of attraction for all those discontented with the American empire and the liberal multiculturalism that serves as its quasi-official ideology. These malcontents include elements traditionally deemed both “left” and “right”: from BRICS enthusiasts longing for a revival of Third World sovereign development to conservatives contemptuous of western liberal achievements in such domains as gay rights. An economically ailing country with fewer people than Bangladesh, ideologically Russia punches above its weight. Cultivating anti-immigrant sentiment in Europe, it has also convinced many Europeans that it has solutions to the crises in the countries from which the immigrants come. In Germany its admirers include both the Alternative für Deutschland (AfD) and Die Linke leader Sahra Wagenknecht. At home it promotes Marine Le Pen, while abroad it upholds its anti-Nazi heritage in the face of US collusion with Ukrainian Bandera admirers. Russia’s self-promotion as savior of Europe takes place not only on Russia Today or Sputnik but also in more mainstream western media. A 2010 New York Times editorial by Boris Gromov and Dmitry Rogozin portrays the 1980 Soviet intervention in Afghanistan as a “defense of western civilization,” rather than reluctant support for a communist state threatened by a US-backed rebellion. Putin himself produced the one critique of “American exceptionalism” to appear in a mass-circulation US paper, closing with a Christian invocation of God according his blessings to the nations. Even with regard to Islam, Putin has carefully echoed the western script. At a time of tension with Turkey, he ascribed Erdoğan’s faults to his religious orientation, saying, “we too support Islam, as one of the historical religions of Russia,” but that the Islam pushed by Erdoğan’s government went over the line. In a 2015 speech at the opening of a major Moscow mosque, Putin framed Russia’s forthcoming Syrian intervention as a defense of “authentic” Islam against falsifying IS terrorists. Just as in the prevailing western rhetoric, the question of Islam appears to concern the character of faith, rather than a configuration of public piety reinforcing state power. Given Putin’s promotion of the Orthodox Church, and even of conservative family politics in Muslim Chechnya, a properly political critique of public religion would be hard for him to manage. Russia’s propaganda campaign promotes the country, not as a counterweight to the West, but rather as representative of a “western civilization” purged of its debilitating limitations: disintegration of the family, atomized individualism, sponsorship of non-western fanatics. Its prosecution of a “war on terror” in Syria is, among other things, a part of that campaign. 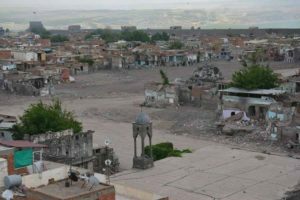 The Kurd city of Diyarbakir (Sur) after the attack of Turkish forces. The “war on terror” script is mobile: it can be applied internationally or within one’s own borders. Turkey has applied it to restive Kurdish cities, killing thousands, burning hundreds alive and wiping entire districts from the map. Saudi Arabia is applying it in Yemen with American weapons and with help from American advisors. Russia is applying it in East Aleppo. Who can stop them? There is no global police force whose interventions might transcend the particular interests of the nation-states underwriting it, while rebels “on the ground” will almost always be outgunned by nation-state armies. A transnational impartial police force is in fact impossible. US officials can celebrate the prosecution of evildoers—some of whom really live up to that name—by the International Criminal Court, to which the US is not a signatory. Logically, it cannot be otherwise. The ICC could not function without an enforcement arm immune to prosecution for war crimes, including the violation of sovereignty. Like the World Bank or IMF, the ICC is structurally dependent on the good graces of powers protected from its reach. It may perform good deeds, but will never be free of the charge of partiality. This asymmetrical structure of global power motivates the excesses of those anti-imperialists who defend any dictator who appears to be in the crosshairs of western power, and who appeals to national sovereignty to justify his misdeeds. They have a rich fund of western hypocrisy to point to. Liberal outrage over Russia’s crimes rarely extends to the similar destruction taking place in Yemen, where such Assad-esque tactics as double-tap bombings and apparently deliberate targeting of civilians appeared early on. Rebel shelling of West Aleppo, which is not nothing even if it claims fewer casualties than Assad’s bombings, is also largely invisible to the western public, as are the one and a half million civilians whose running water rebel forces cut in revenge for the Russian bombing of a water-treatment plant that serves the city’s eastern portion. Moreover, the selective attention afforded to Russia and Syria’s victims has subtly corrosive effects on the solidarity that western audiences might develop even toward those same Syrians. The proliferation of disturbing photographs works to call our attention to Syrians’ plight while also subtly reducing them to “bare life,” or biological existence without political subjectivity. Aside from the comprehensible appeal to common sympathy, there is also a darker side to the victims so often brought to our attention being children. Adults have a political existence that we rarely ascribe to children: hence the widespread belief in their innocence. As Hillary Clinton has acknowledged behind the closed doors of Goldman Sachs, a “no-fly zone” would require bombing airbases located in urban areas in order to destroy the infrastructure behind Syria’s air war, protecting civilians in some places at the cost of other civilians’ lives. Rather than call for intervention by powers they deem imperialist, many on the Left have echoed the claim made by Syrian radicals themselves that shipments of shoulder-held anti-aircraft weapons would enable them to hold off Assad. Clearly, this idea contradicts the war on terror script; the USA rejected the plan early on, so as to reserve air superiority for prospective campaigns like the one in which it is now engaged in support of Kurdish forces fighting IS. Yet there is also reason to doubt that shipping “manpads” to the rebels would even work. It is true that Assad has come to depend on Syrian and Russian air power to compensate for the relative weakness of his armies on the ground. But since its direct intervention into the war a year ago, Russia has begun to deploy sophisticated aircraft that can evade manpad strikes. The small handful of downed Syrian and Russian aircraft in recent months indicates that Sunni Gulf States have indeed sent the anti-aircraft weapons that the US would not supply—and some of these have even fallen into the hands of IS—but these few successes have barely made a dent in the war. Activists like Joseph Daher make a strong case that Assad must be removed in order for the inter-communal bloodletting to stop; but barring a massive upsurge in the Russian antiwar movement’s influence on state policy, it is doubtful that anything short of a direct US military intervention could now overthrow Assad. Since 2001 the United States has pursued a contradictory policy, declaring global war on “Islamic fundamentalism” while undermining states to the benefit of reactionary Islamists. Russia is keenly aware of this contradiction and has exploited it to outmaneuver the US diplomatically. The September agreement isolating Al Nusra from the rest of the opposition required only that the US take seriously its own designation of the group as “terrorist,” which it had hardly done back when it was providing anti-tank weapons to the Gulf State-sponsored Army of Conquest. 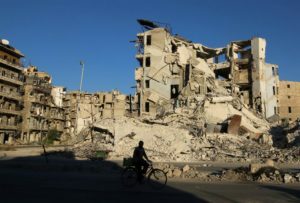 By the terms of the September ceasefire, the US now looked ready to jettison its anti-Assad efforts in favor of a renewed “war on terror” in cooperation with Moscow. Then came the US attack on Syrian troops in Deir-ez-Zor, which pro-Russian commentators saw as the act of a US military “deep state” to sabotage the deal worked out by the State Department. The US insists it was an accident: the intended target was an IS force whom the Syrian Arab Army was also fighting. This would have been the first time the US attacked IS on a front where Assad’s army would benefit. Whatever its motivations, the US bombing at Deir-ez-Zor issued from the “war on terror” script. Along with the refusal or inability of rebel factions to separate from Al Nusra, the bombing provided the Russians with a reason to abandon the ceasefire and resume the heavy bombing of East Aleppo. It is unlikely that even trigger-happy Hillary Clinton will risk war with another nuclear power to rescue that city’s civilians. It is still more unlikely that those citizens, sandwiched between Russian air power and a ground army dominated by jihadists, can do much to rescue themselves. Few deny at this point that Assad and his allies have imposed an embargo to starve East Aleppo into submission. Yet rebel factions are also doing their part if, as some reports indicate, they have used force to keep civilians from leaving at times when the Syrian army permits them to do so. The rebel-held Tariq al-Bab neighborhood of Aleppo in September. Ironically, an anti-imperialist and anti-authoritarian Left has one thing in common with Daniel Pipes and the right-wing National Review: we want to oppose both the Saudi-Turkish-Qatari-Al Qaeda block and its Iranian and Russian counterparts in the “axis of resistance.” We cannot expect either of these forces to act as patron to a politics of emancipation: democratic, non-sectarian, and socialist. There exist, in pockets of rebel-held territory now guarded by Islamist militias, people who share these commitments; whether there is anything we can do to help these people to victory in the current war is another question. Aleppo is a conundrum that the international Left should face with open eyes—not because remaining in a state of eternal aporia is a helpful response, but for the sake of humility and an honest self-assessment. Leftists have little influence on the doings of imperialist states, though those who are citizens of those states must do what their reason tells them is necessary. For my part, I doubt that we can rescue the latest victims of the “war on terror” by appealing to the power that patented the script. One Response to What is Aleppo?